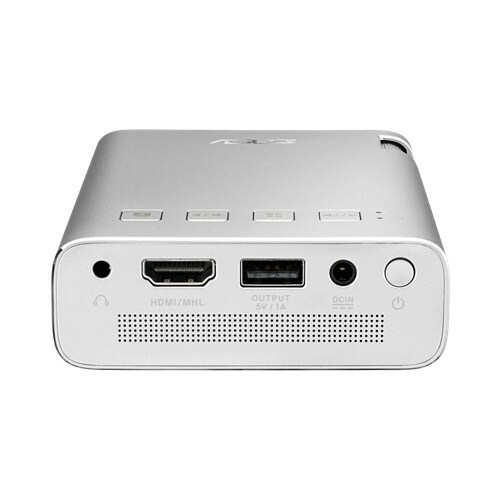 Asus launched the micro-projector ZenBeam E1 in May. 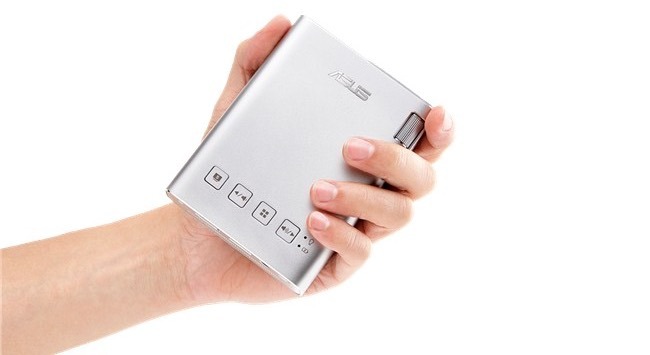 It’s a small and portable projector that fits in your palm. It’s designed to enable large screen visualisation from mobile devices like phones and tablets. Another cool feature is that Asus ZenBeam E1 is capable of charging external devices like your mobile phone using its built-in battery. The dimensions are a tiny 83 x 29 x 110 mm. However, ZenBeam E1 can project images from 15 inches to 120 inches despite its small size. The maximal light intensity is 150 Lumen. It’s easy to connect to the projector using the HDMI port. A phone could use a cable while Chromecast could connect directly to the port and then start streaming video from a computer or laptop. Image source: Asus. Asus ZenBeam E1 back panel. Note the limited number of ports. The maximum resolution ZenBeam E1 can display is WVGA (854 x 480). It can receive higher resolution data like full-HD, but will then scale it down to WVGA format. The LED lights of this projector last 30,000 hours, which is considered quite good and should suffice for most consumers. It’s always possible to use it as a charging device once the LED lights have been worn out. Asus ZenBeam E1 can also act as charging source for your mobile devices. It has a powerful battery with a capacity of 6,000 mAh. Just remember that the battery is used to also power the projector when in use. Asus NZ still doesn’t list ZenBeam E1 on the site. However, it’s sold by local retailers and the current price is about $500 inclusive of GST and shipping.